I’m hot off the heels of Forecast, the collaborative painting-poetry exhibition at Weilworks Gallery in Denver, and riding the joy of word-art creations. In fact, I now see creative collaborations at every turn, and I couldn’t be happier. My latest discovery was found at a website dedicated to Altered Books (I found this site through StumbleUpon, another wonderful creation. More on that in another post). 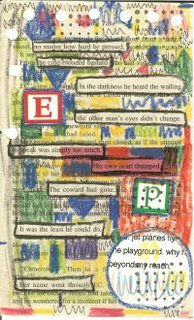 The site showcases visual poetry created by artists and writers who have blended forms by scribbling, painting and scratching through books. From a process of word elimination, poetry and art emerge. It’s clever, creative and fun. Here’s the Idea: Cut the bindings off books found at used bookstores or thrift stores. Find poems in the pages by the process of obliteration. Put pages in the mail and send them around the world. Lather, rinse, repeat. Many of these pages have been turned into books. Some into pages circling the globe. Still others are works of art, suitable for framing. The possibilities are endless, and I can’t wait to start! The piece at right, Doubletake Poem 2, is by Donna Kuhn, a California artist. Newer PostScratch (more) words. Make (more) art.